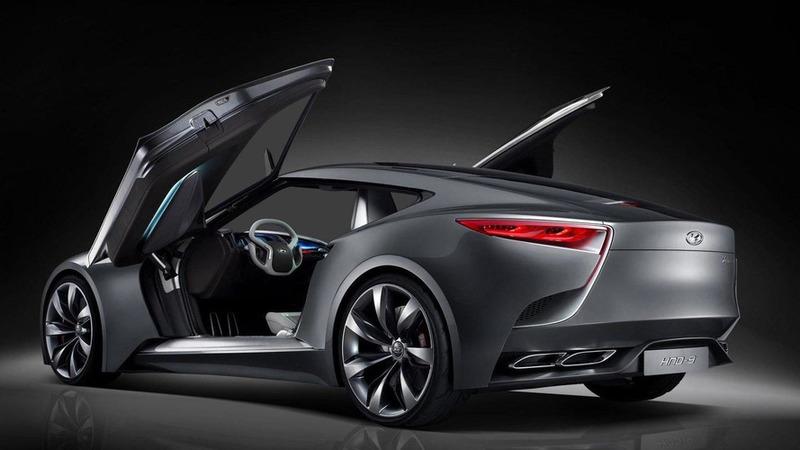 Hyundai has presented the HND-9 Concept at the 2013 Seoul Motor Show this week. Serves as a preview for the next-gen Genesis Coupe. Hyundai has presented the HND-9 Concept at the 2013 Seoul Motor Show this week. Conceived as a preview for the next-gen Genesis Coupe, the firm's ninth concept (hence the designation) measures 4,695mm long, 1,890mm wide and 1,340mm tall, with a 2,860mm wheelbase. Its dramatic styling represents an evolution of the Fluidic Sculpture design philosophy and brings an elongated hood, powerful character lines, butterfly doors and a hexagonal-shaped grille. It rides on 22-inch alloys made with carbon materials and has dual exhausts on both sides. The interior was developed to provide a luxurious and modern driving experience, with sporty seats which project different colors depending on the angle these are seen from. The high-tech interface is driver-oriented and has been modeled after a cockpit. The rear-wheel drive coupe is powered by a 3.3-liter GDI turbocharged engine producing 362 bhp (270 kW) linked to an eight-speed automatic transmission.